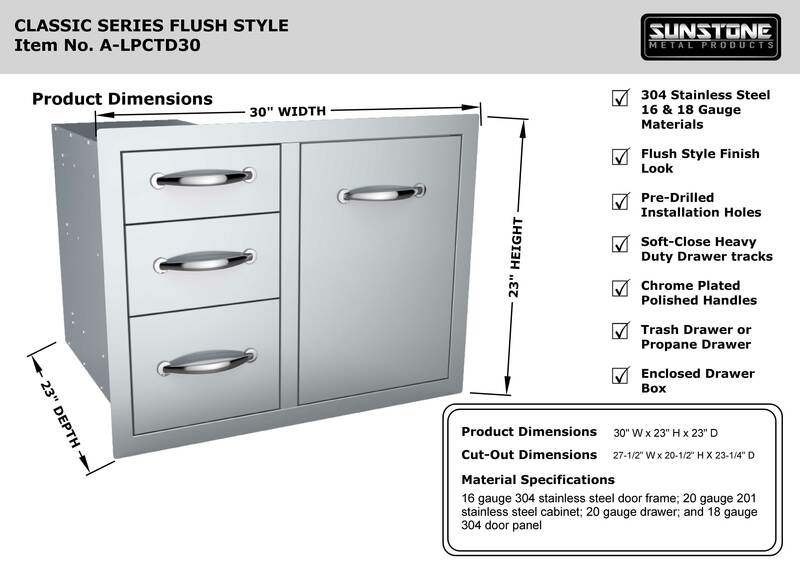 Sunstone Classic Series Flush Style 30 Inch Combo Tank Tray Triple Drawer Unit compliments most BBQ Grill sizes between 28 In.to 36 In. 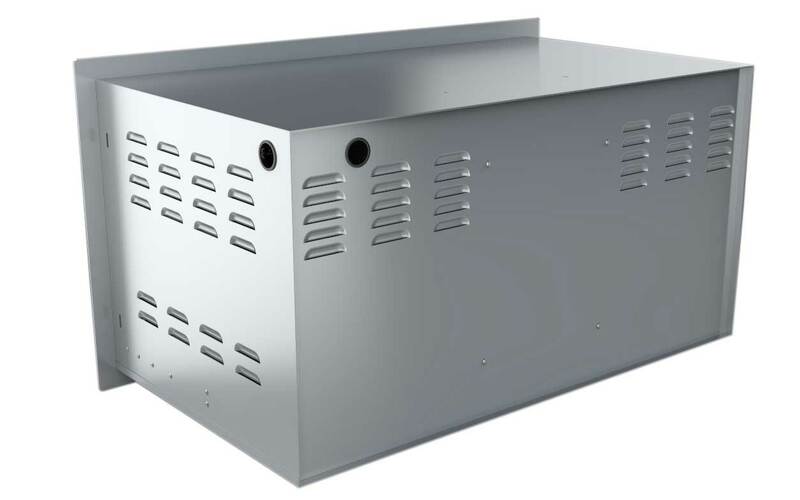 and because of its unique variability it works well with your Cleanup or Serving Zones. 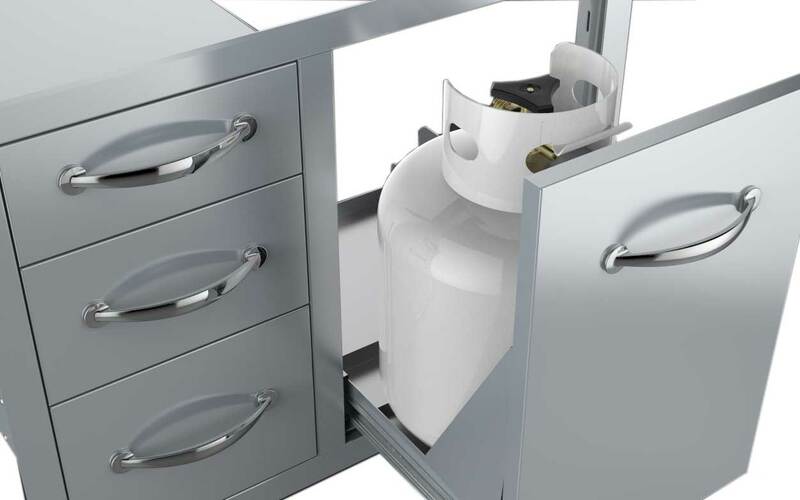 Three Large Drawers provide easy access for all your larger BBQ Sauces, Towels, and BBQ Tools plus the versatile right side Pull-Out Tray Drawer works perfectly for either a Large Propane Tank Storage, or Loose Trash Bag with the included adjustable Trash Ring. 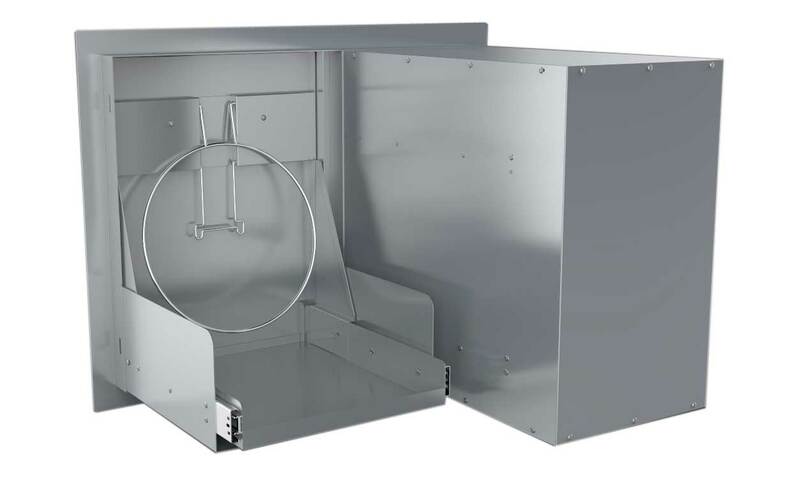 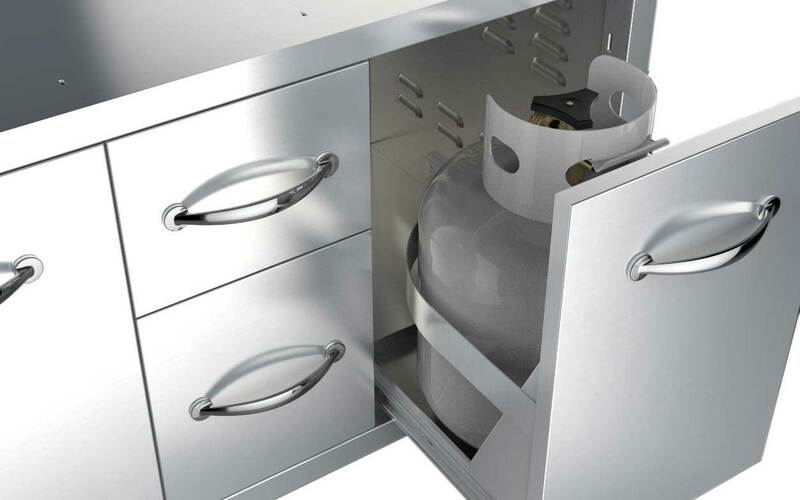 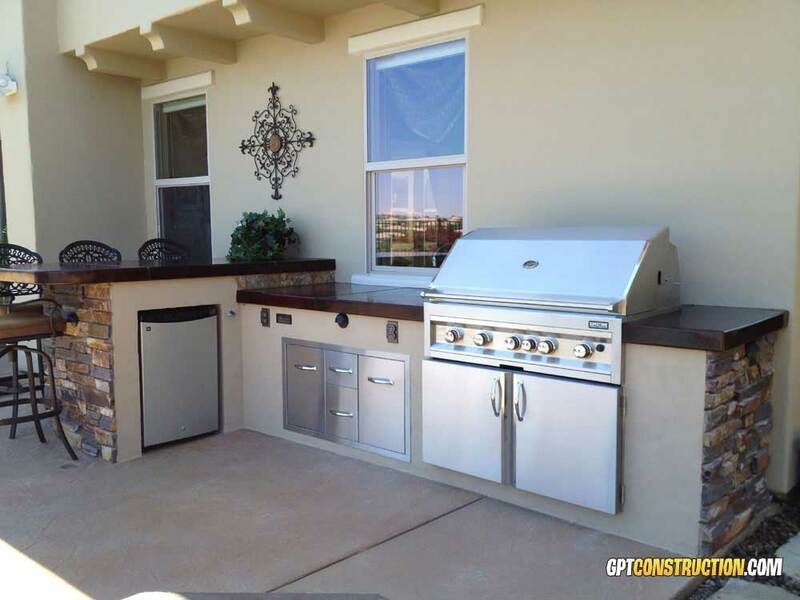 The Slide-Out Tray Drawer is an open design offering up easy access for any Gas-Lines running to the Grill, or remove the Slide-Out Tray Drawer for full access to the interior of your Island’s Construction. 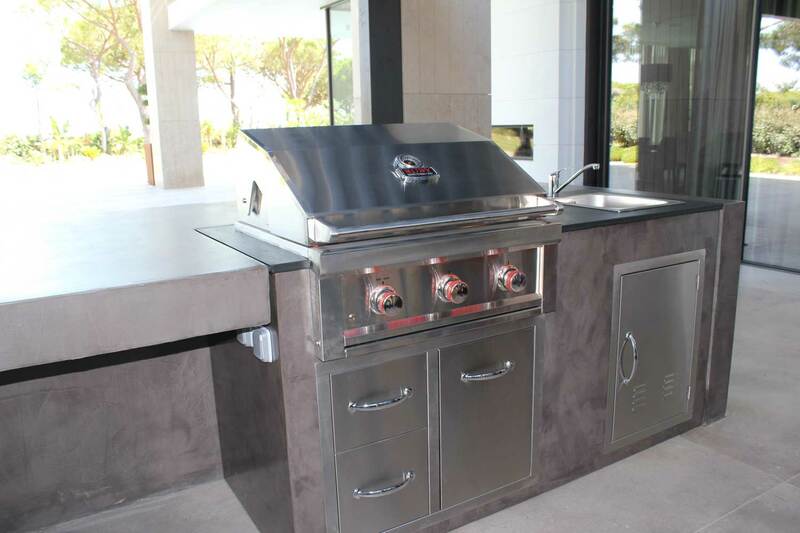 Constructed with all 304 Stainless Steel Frame and Paneling and Drawer Boxes, with complimentary 201 Stainless Steel enclosed drawer box. 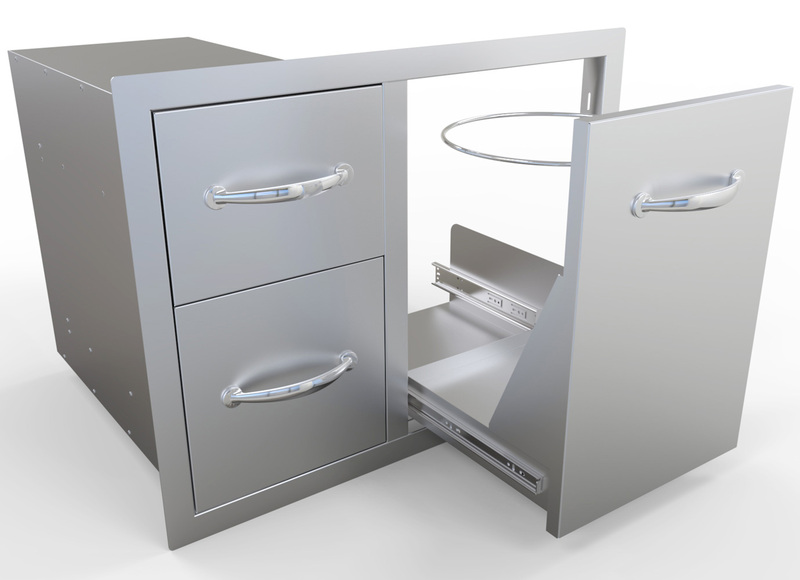 The Combo Drawer Unit is designed to Blend perfectly with most other industry Brands, BBQ Grills and Components with its even toned #4 Horizontal Light Brushed Finishes and all Large Polished Chrome. 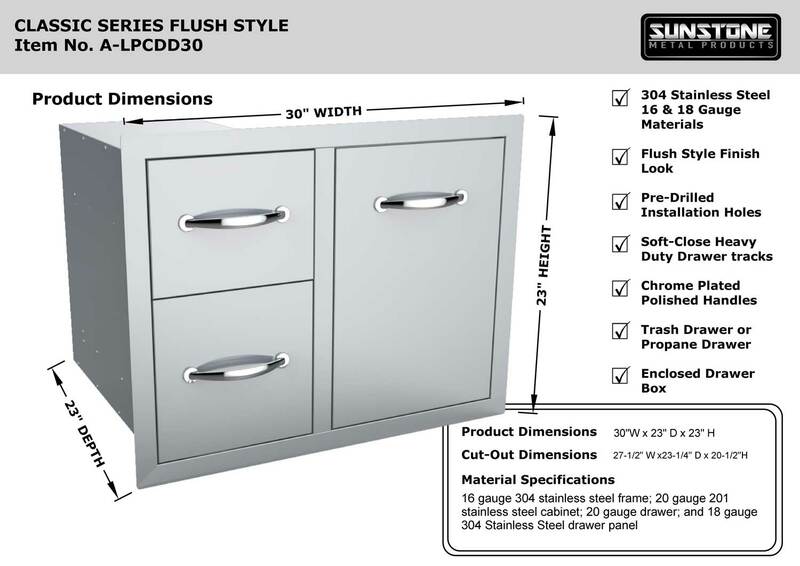 Sunstone Classic Series Flush Style 30 Inch Combo Tank Tray Double Drawer Unit compliments most BBQ Grill sizes between 28 In.to 36 In. 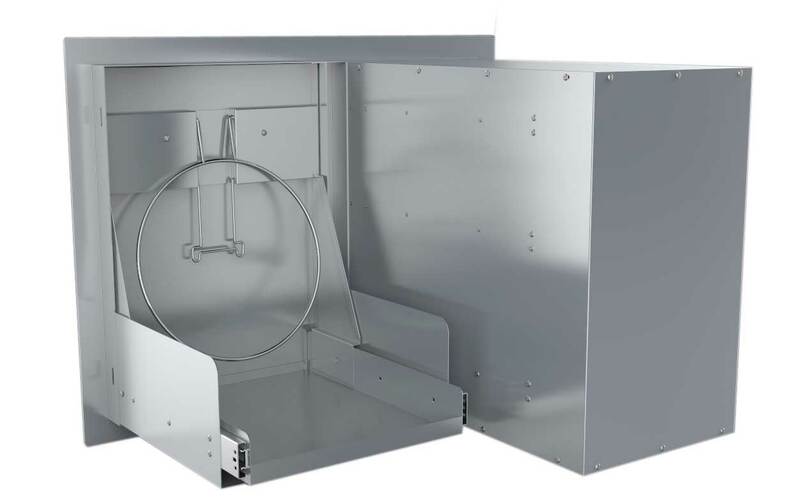 and because of its unique variability it works well with your Cleanup or Serving Zones. 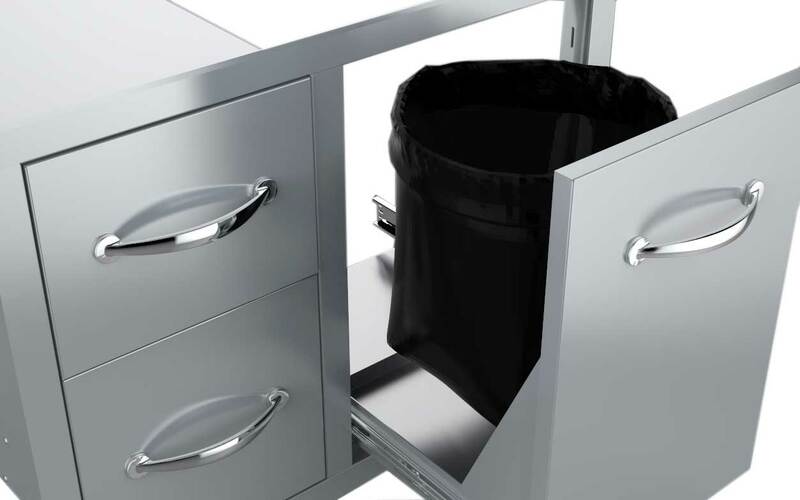 Two Large Drawers provide easy access for all your larger BBQ Sauces, Towels, and BBQ Tools plus the versatile right side Pull-Out Tray Drawer works perfectly for either a Large Propane Tank Storage, or Loose Trash Bag with the included adjustable Trash Ring. 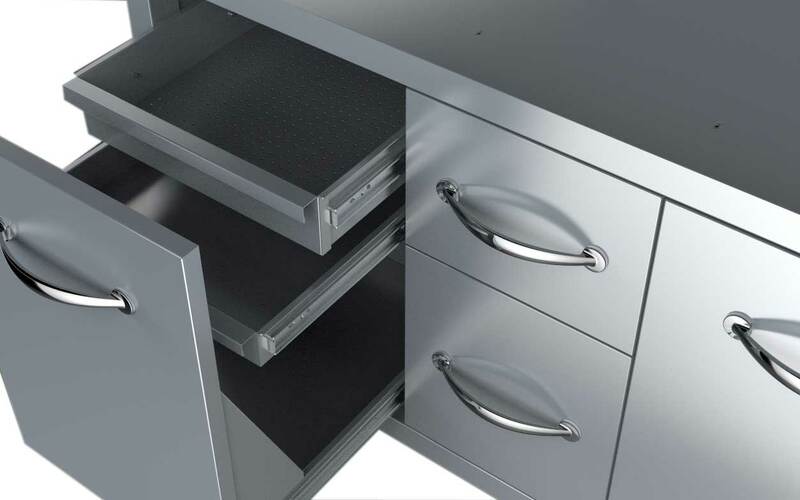 The Slide-Out Tray Drawer is an open design offering up easy access for any Gas-Lines running to the Grill, or remove the Slide-Out Tray Drawer for full access to the interior of your Island’s Construction. 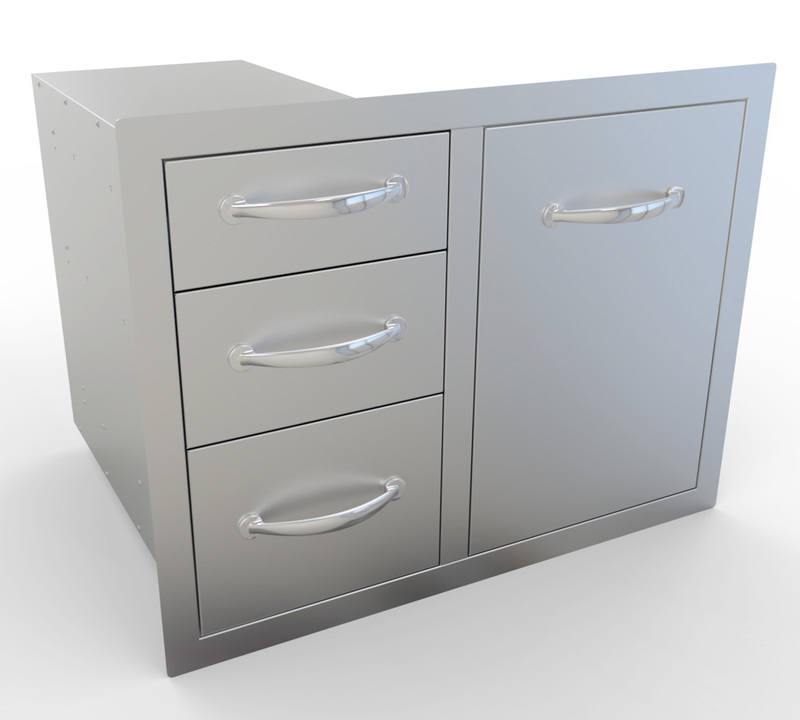 Constructed with all 304 Stainless Steel Frame and Paneling and Drawer Boxes, with complimentary 201 Stainless Steel enclosed drawer box. 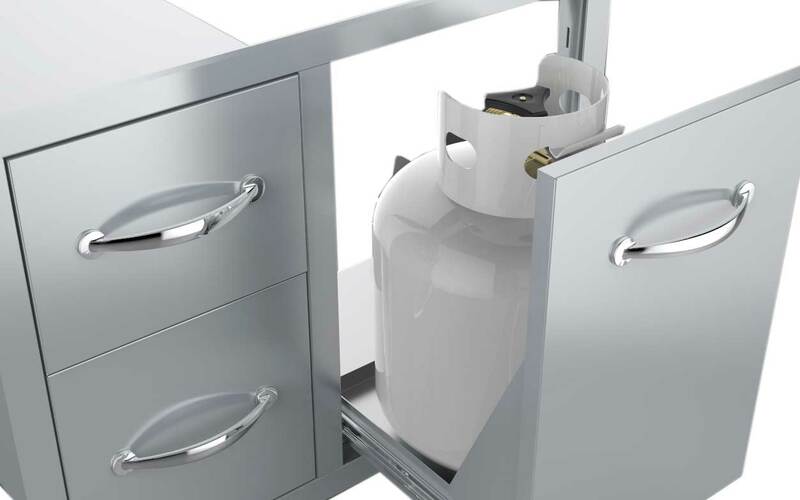 The Combo Drawer Unit is designed to Blend perfectly with most other industry Brands, BBQ Grills and Components with its even toned #4 Horizontal Light Brushed Finishes and all Large Polished Chrome. 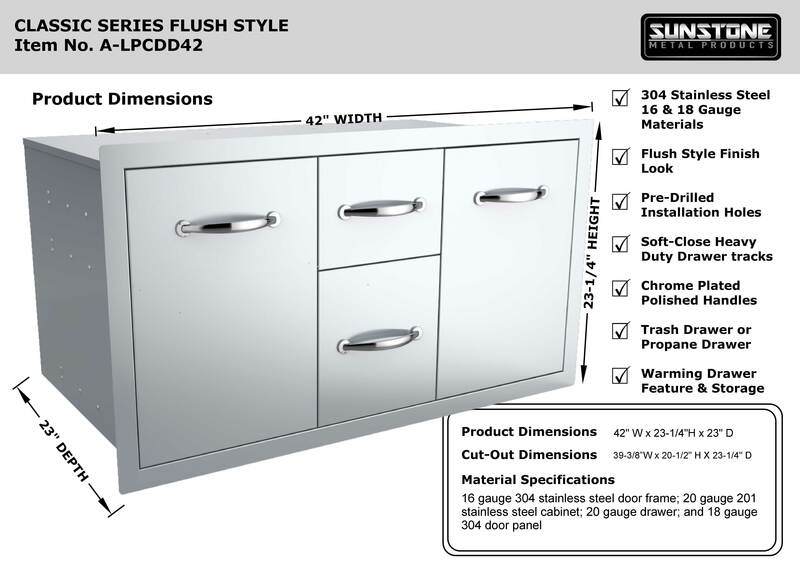 The Sunstone® Classic Series Flush Style 42” Multi-Storage Combo has absolutely everything needed for your outdoor kitchen, featuring one of the largest all in one solution with two spacious center drawers, on the Right Sides well as a roll out drawer for storing a trash bin. 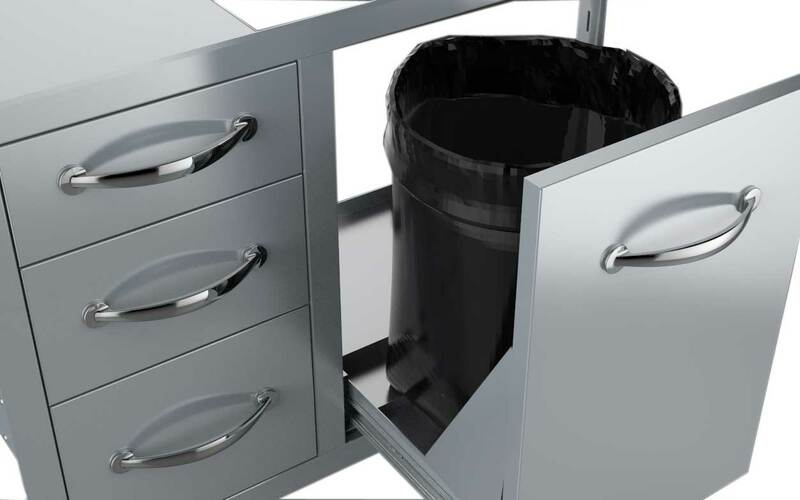 On the Right Side see the Full Height Drawer with roll-along drawer base, perfect for either a Portable Propane Bin, or Trash Bin – even has an adjustable Trash-Bag Ring for a no-fuss Loose Trash Bag. 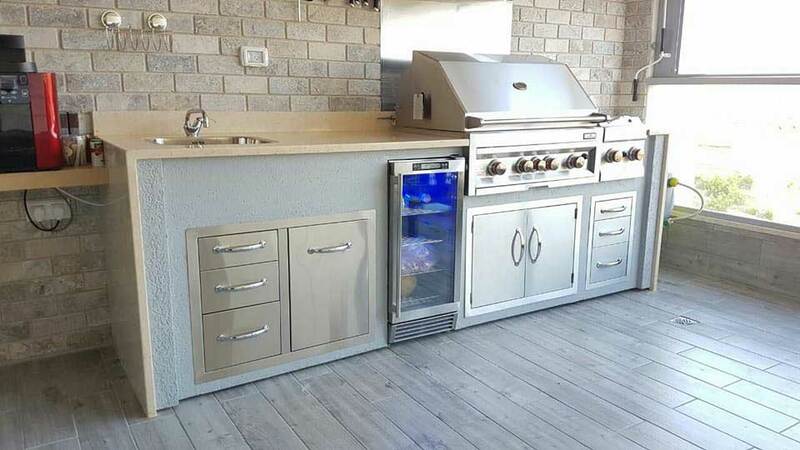 On the Left features a Multi-Leveled Full-Height Drawer with interior stationary shelf for “Sterno Canisters” and above that a Perforated Holed Deep Drawer, perfect for warming your Hamburger Buns and keeping your freshly grilled food fresh. 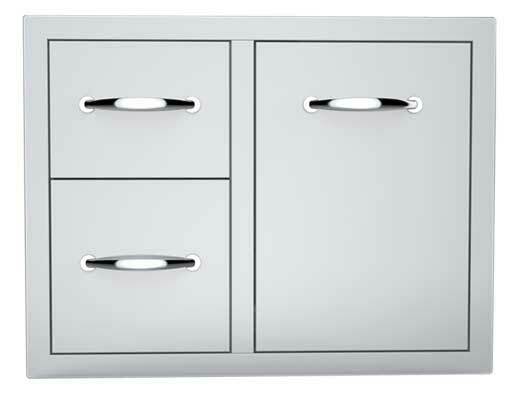 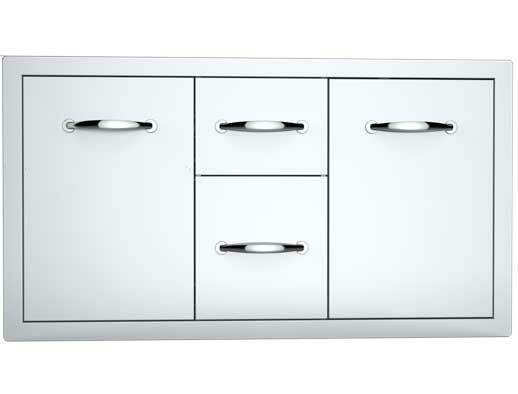 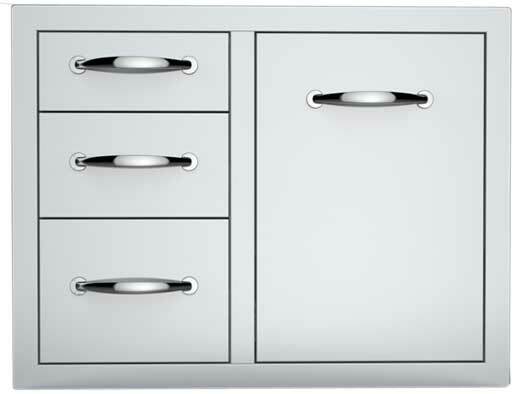 All drawer tracks feature High-End Soft-Closing Tracks, and finishing this with beautiful Chrome Polished Handles.